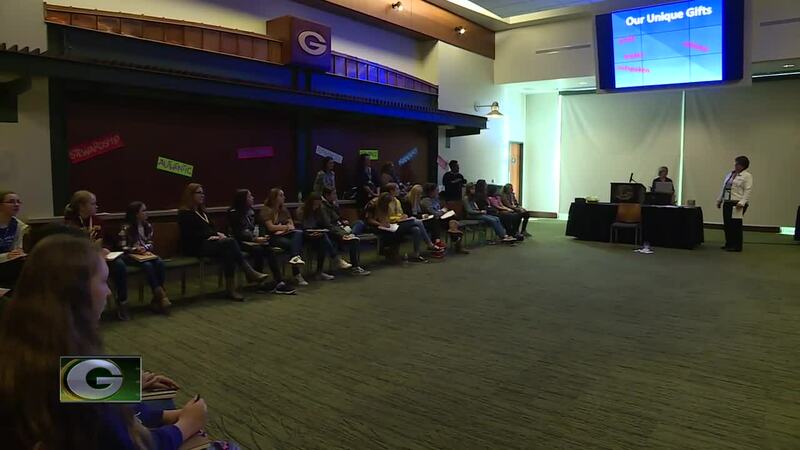 The Green Bay Packers hosted the 5th Annual Empower Leadership Event at Lambeau Field on Wednesday. 140 girls from Brown County middle schools were part of the day-long event. The goal is to inspire and encourage middle school students to develop into leaders for tomorrow. "And when we look at what our values are, and that stewardship, it's reaching out into this community,” said Green Bay Packers Community Outreach Coordinator Amanda Wery. “To make sure that we are giving back. Not just to adults, or to fans or to guests, but to those kids too who really have those leadership skills very deep within. And can make our community as a whole, a better place." On Thursday, 140 middle school boys will be at Lambeau Field developing their leadership skills. GREEN BAY, Wis. — The Green Bay Packers hosted the 5th Annual Empower Leadership Event at Lambeau Field on Wednesday. 140 girls from Brown County middle schools were part of the day-long event. The goal is to inspire and encourage middle school students to develop into leaders for tomorrow. "And when we look at what our values are, and that stewardship, it's reaching out into this community,” said Green Bay Packers Community Outreach Coordinator Amanda Wery. “To make sure that we are giving back. Not just to adults, or to fans or to guests, but to those kids too who really have those leadership skills very deep within. And can make our community as a whole, a better place." On Thursday, 140 middle school boys will be at Lambeau Field developing their leadership skills.